It sounds — and looks — like something from the Indiana Jones movies. But the Chapel of St. Kinga, located 300 feet underground at the Wieliczka Salt Mine in Wieliczka, Poland, is real. And made almost entirely of rock salt. The salt mine itself was in use from the 13th century until just a few years ago when, in 1996, it was shut down from commercial use due to flooding in the mine and a drop in salt prices. All together, the mine extends over 400 feet underground, and the full walking tour requires a nearly two mile walk, snaking through various mines, the Chapel, and an underground lake, seen here (with other photos). But the main attraction is St. Kinga’s. The Chapel, pictured above (and another incredible shot, here), was built starting in 1896 and continued for decades, by the miners who worked in the salt mines during the period. 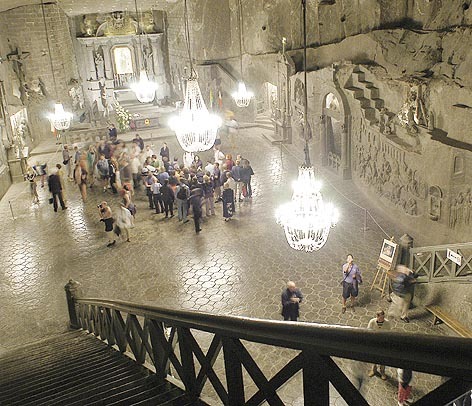 It features a relief of The Last Supper; a statue of St. Barbara, the patron saint of miners; a statue of Pope John Paul II (who was born in Poland); and a series of chandeliers — all made of rock salt from the mine. Some of the earlier carvings were created by the miners themselves, while more modern ones are commissioned works from artists. Bonus fact: Kraft sends almost all of its cheese products underground, too — into a 400,000 square foot, 100 foot deep subterrainian cavern which acts as a giant refrigerator. It’s not there because the rent is cheap, but because being so far below the Earth’s surface makes it easier and less expensive to keep the cheese products cool. From the Archives: The World’s Largest Cave: Self-explanatory. Also, Schtroumpf: It’s about salt.